Inspired by the internet connected claw machine, Kyle has built an internet connected slot machine. But it's not what you might think. There is no money flow in or out of the machine. The machine is connected to a host PC (running Linux) and allows software on the PC to command the machine to play. It also reads out any pay outs from the slot machine, and tricks the machine into thinking that the coins were paid out (there are no coins in the machine.) With every play an entry hits a SQL database logging the play, and any payout that may have occurred. Thousands and thousands of plays later there is data to be played with. 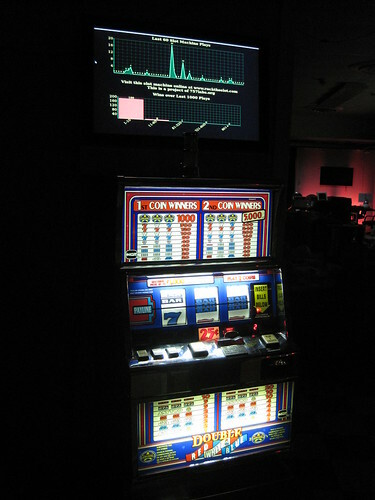 Live video of the machine is also streamed onto the internet via the machines web page, and visitors can claim a spin of their own. Nothing is payed out, it's all in the name of fun and numbers. Information on the last plays is reported on a flat panel display that was repaired at the lab (thanks Jerry!) so that those curious can look in and see how it's going. Kudos to Kyle for a job well done on a unique project! More project information is in our wiki page about the project.